First week of the summer CSA brought us a ton of leafy greens to eat: green leaf lettuce, rainbow chard, spinach, and the greens from the aforementioned beets meant that it was a very leafy pickup. 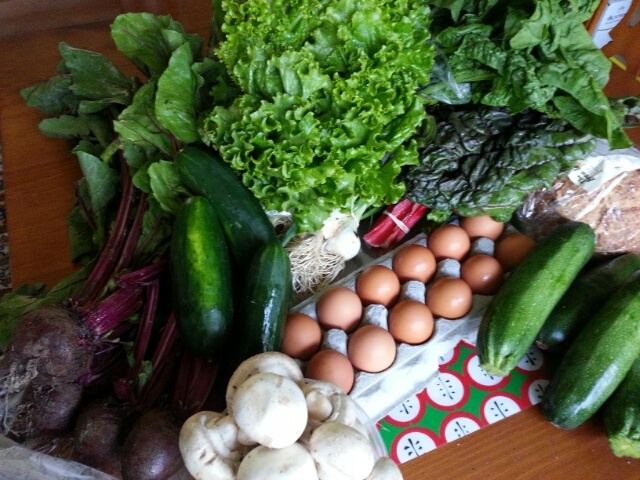 Also in the pickup: spring onions, mushrooms, zucchini, and the usual eggs and bread (Breadery 3-seed). I cut up and washed the green leaf lettuce right away. Lettuces don’t hold up well in the fridge. We had it alongside white rice and a frittata of kielbasa, spinach, and cheddar cheese. The Little Prince actually ate his entire serving of “egg pie”, much to my delight. No fancy plans for the rest of the pickup; I might end up just sauteeing the beet greens together with the chard, let the thick-stemmed greens hang out together. Zucchini is fantastic tossed with a bit of olive oil and spice, and baked on a sheet pan or quickly sauteed on the stovetop. Spring onion greens might go in another frittata with the mushrooms (there are oh so many eggs in the house right now), and I’ll save the spring onion bulbs to throw on the grill next time it’s fired up (they turn sweet and smoky and fantastic; I highly recommend it). Beets, I’ll probably try some sort of pickle. Or puree into soup with a little garlic and cream. The weather yesterday was beautiful and I was absolutely loving being at the farm. It was nice to see the llamas again, too. 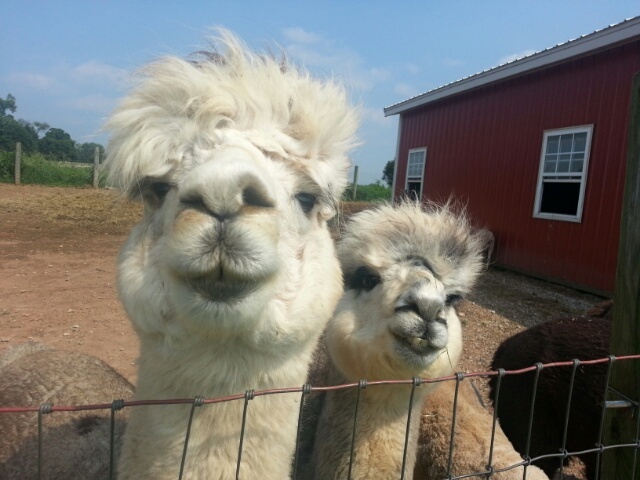 Hi, llamas! This entry was posted in CSA by kat. Bookmark the permalink.